← Can I see the transit? Ingress, exterior (or first contact): the point at which Venus’ disc is just touching the outer edge of the Sun. Shortly after, the planet appears to make a small black indent on the solar disc. Ingress, interior (or second contact): the point at which the entire planet has moved onto the solar disc. Egress, interior (or third contact): the point at which the planet touches the opposite solar limb. Egress, exterior (or fourth contact): the point at which Venus is just outside the Sun’s disc, concluding the transit. Aureole: the bright arc seen around the circumference of Venus’ disc partially outside the solar limb during ingress and egress. It was first observed during the transit of 1761 and revealed that Venus has an atmosphere. The effect is caused by refraction of sunlight in the dense upper atmosphere of Venus. Black drop effect: the small black teardrop shape that appears to connect Venus to the limb of the Sun as it fully enters the solar disc just after ingress, interior, and just before egress, interior as it begins to leave. It is thought to be an optical effect caused in part by the effect of observing through Earth’s atmosphere, combined with diffraction of light inside the telescope, and by the dimming of the intensity of the Sun’s surface just inside its apparent outer edge. 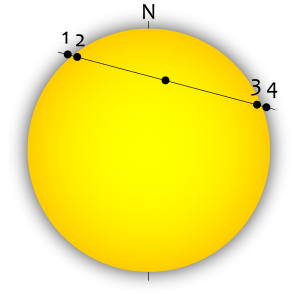 Greatest transit: the point at which Venus is in the middle of its path across the solar disc, marking the halfway point in the timing of the transit. This entry was posted in Transit of Venus and tagged Aureole, Black drop, Venus transit 2012. Bookmark the permalink.